Professional advice and resources for nuisance bird and pigeon problems. Birds, though nice animals, can be amongst the worst of nuisance animal pests, especially for commercial property owners. Birds often choose to roost on signs, ledges, or rafters of commercial buildings. This might not be so bad, except for the fact that they make a horrible mess with their nesting material, and worse, droppings. Pigeon droppings in particular can really accumulate, and are not only unsightly, but a health risk to you, your employees and customers. To the right you will see some pigeons that I captured using standard pigeon traps, placed on the roof of a commercial property where they created a nuisance with their unsightly and disease-ridden droppings. After you read the below information, in the event that you wish to hire a bird removal company, you may want to see how much does bird removal cost? Pigeon Habitat: Pigeons have adapted well to urban environments. Most cities are full of flocks of these birds, just looking for handouts. They often associate humans with food, and are unafraid to flock closely to people. They are also unafraid to leave droppings everywhere (cars are obviously preferred spots), along with nesting material. The nesting material can clog vents and drain pipes, and cause potential fire hazards. The droppings and feathers can contaminate large quantities of livestock feed and food destined for human consumption. If that's not enough, pigeons lack the common decency to rid themselves of parasite and disease before they enter our urban areas. Bird-Related Diseases: These "flying rats" or "gutter birds" can carry or transmit: pigeon ornithosis, encephalitis, Newcastle disease, histoplasmosis, cryptococcosis, toxoplasmosis, pseudo-tuberculosis, pigeon coccidiosis and salmonella food poisoning. Pigeon parasites include a number of bugs, fleas, ticks and mites. Click for my pigeon and bird removal gallery. Click here for my bird removal journal blog. Wondering how to get rid of birds? There is no magic spray or device that you can use to make them go away. Some people try to sell fake plastic owls or plastic hawks to get rid of pigeons, but that doesn't work. They also try to sell ultrasonic sound emitters. These devices are worthless at eliminating birds. Some old wive's tales recommend the use of mothballs or ammonia-soaked rags to make them leave, but I've been to countless homes where these techniques failed - biologists know that these attempts won't work. The ONE AND ONLY WAY to take care of your problem is with the installation of deterrent devices such as bird spikes or even via trapping and removal of the birds. If you need to find a professional pigeon or bird removal expert in your hometown, just click our comprehensive list of hundreds of wildlife removal professionals, and you can have your problem quickly taken care of! My bird removal articles: Some of the topics covered by my bird and pigeon journal blog include information on how to trap a pigeon, and also the alternative method of pigeon exclusion, to keep them away, with the use of materials such as bird spikes, for use in pigeon control, jobs, both residential and commercial pigeon projects, to remove pigeons from buildings and to get pigeons out of attic. There are some bogus products out there that don't work for bird control such as the plastic owl for pigeon control. Some of the concerns regarding pigeon infestations are due to pigeon contamination, from all of the droppings, or pigeon poop that these birds leave behind. This can cause pigeon diseases, or illness in both people and the birds, which results in dead pigeons. Another thing that results in dead pigeons is to shoot them with a BB gun, and shooting pigeons is often one way to control them. The best way, in many scenarios in which they are roosting on a building or other structure is to use pigeon spikes to keep them from landing. This is what I do in my Orlando pigeon control business, which mostly consists of urban pigeon removal, since these birds tend to live in cities. 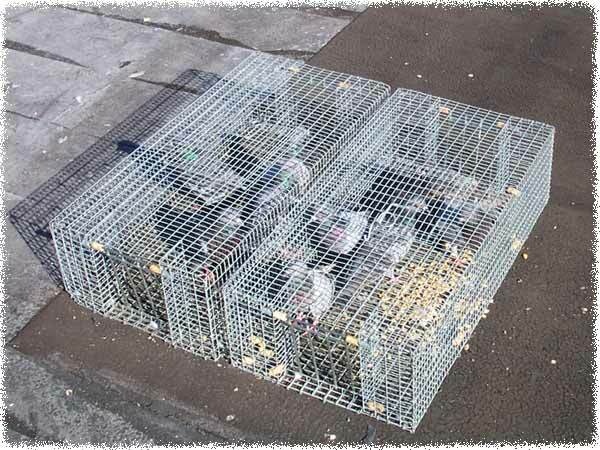 One way to get rid of them is through the tactic of pigeon trapping in cage traps, such as shown in the photo on this page. Although Rock Doves are the primary bird involved in bird management, I also deal with other birds from time to time, and provide vulture removal for these foul birds, duck removal when they get in pools, Sandhill Crane removal when these birds are a problem, peacock removal from time to time, owl removal if owls get inside buildings, hawk removal if a hawk should end up in an inconvenient spot, and Chimney Swift removal when these fine birds fly down the chimneys of homes and make a racket. Sparrows and Starlings often choose to nest in buildings. This causes problems when nesting material clogs vents and drain pipes, and poses a fire hazard. These birds are not as dirty as pigeons, but feces buildup can lead to structural damage from the uric acid in droppings, plus the bacteria, fungal agents and parasites in the feces also pose a health risk. Read more on my full how to get rid of starlings page. Woodpeckers are a nuisance when they decide to peck on your house instead of a tree. Woodpeckers hammer on trees for two reasons: in search of food, and as a signaling device. The males repeatedly sound off to claim their territory (can't they just sing like normal birds? No, they just have to drum). Peckers often find that a wooden house serves as a good place to make their noisy territory claim, perhaps due to better acoustics. If your house has insects, then that gives woodpeckers another reason to peck away. I've seen houses full of woodpecker holes. They can cause quite a headache with their noisy hammering, and quite a lot of damage to a home. Read more on my full how to get rid of woodpeckers page. Canadian Geese are a common problem bird. They simply congregate in large flocks and leave a lot of droppings. They can also be aggressive toward people, particularly if they are guarding a nest. Other, less urbanized birds can cause problems as well, such as noise and unwanted droppings. Seagulls, crows, ducks, vultures, etc. If a bird isn't regularly nesting in an urban area, it can be hard to control, but there are ways. Read more on my full how to get rid of Canada Geese page. Muscovy Ducks live primarily in the south. They are a big problem in some parts of Florida and Texas. These non-native birds are a pest because they congregate in numbers in human areas, and cause damage. They aren't afraid of people, and they simply dig up and befoul yards and lawns with their droppings. They can also cause lake and pond edge damage. Not a huge deal, but many people simply can't stand to have these birds around, and they can be trapped and removed. Read more on my full how to get rid of Muscovy Ducks page. Barns offer excellent cover for a number of birds, the most problematic of which are probably pigeons. Pigeons are messy, nuisance birds that roost in numbers and return to the same locations time and time again. Because of the excellent homing ability, it is virtually impossible to relocate a pigeon that has taken a shine to your barn. The only way to get rid of pigeons is to exclude them from your property. This type of tactic does not include the use of owl decoys, though many people buy these statues anyway. Decoys don't work. Anyone who has tried one can tell you. To exclude pigeons, the simplest method may simply be to close the barn up when not in use. If the open doors are the point of entry, keeping them closed should solve your problem. If, however, the entry point is through a damaged part of the roof or structure, you will have to fix this hole or the pigeons will remain. Pigeon elimination is best done before any eggs hatch or you will have to face the dilemma of dealing with orphaned pigeon hatchlings. There are many appealing things about a roof to attract pigeons. Roofs often have a variety of nooks and crannies on which pigeons can build their nests. Pigeons in a roof can be noisy and extremely messy, and their waste poses a serious health hazard. To get rid of pigeons you need to take the proper steps to exclude them from you home. If you roof is damaged and that damage is why you have pigeons, the area will need to be repaired before the birds will go away. Roofs that do not need maintenance may need to be fitted with pigeon nets or spikes to discourage the birds from landing once they have arrived. Netting and spikes are the most common, effective means of exclusion, though some success with electrified roosting strips has been seen. Depending on your budget, you can usually find an easy and affordable way to keep pigeons off your home. Pigeons are unscrupulous when it comes to seizing the opportunity to live inside a home. Damaged eaves are prime area for pigeons to roost. Not only do eaves provide shelter from the weather, they also have the potential to lead into attics and crawlspaces. The only way to effectively keep pigeons out of your eaves is to fix the damaged area. Once the repairs are completed spikes and netting can be secured to the home to prevent the birds from returning and gaining entry. Pigeons have an excellent homing ability, so they cannot be removed and relocated easily. The best way to get rid of pigeons is to make them want to leave on their own. Pigeon exclusion includes making sure you do not leave out enticing food sources. Even if you have managed to keep pigeons out of your home, leaving out food when you are having a nuisance issue will keep the birds around your property. Feeding problem pigeons is one of the worst things people can do. These birds have become so dependent on humans for food that they have abandoned their natural food sources in favor of scavenging. In urban areas where tall buildings go untouched for years, pigeons can become a serious problem. Abandoned skyscrapers are often boarded up along the bottom where human miscreants can gain entry, but the upper floors are rarely kept sealed once the original boards and barriers deteriorate. Pigeons take the opportunity to move into these buildings for excellent shelter and protection from predators. An abandoned building of this caliber will have numerous broken windows and entry points. Removing the pigeons once they have entered becomes quite a chore. To get the pigeons out of the building, the birds will need to be confined to floors so they cannot escape upward or downward. A team of people will flush the birds out by harassing them and then must immediately seal off all the open areas to prevent the pigeons from returning. Care must be taken to remove any nests, eggs and hatchlings. Once the pigeons have been dispersed, sealing up the building should be adequate unless outside roosting areas are a problem as well. If this is the case, exclusion tactics such as netting and bird spikes will help discourage pigeons from landing. Attic invasion often starts with eave invasion though some homes have given pigeons access through broken vents or attic windows. If you have discovered a pigeon problem in your attic, getting the birds out will not be easy. Attics can be large or small and they are usually unfinished. If you're lucky your attic has a window. If not, your task becomes more difficult. To get a pigeon out of the attic, open a window if you have one and shoo the bird out. Repair the damaged area that allowed access. If the pigeon has entered through a damaged vent or eave, you may need to wait for the bird to leave on its own. Harassing the pigeon will only make it fly wildly around the attic. Any eggs should be removed. If hatchlings are present, you can contact a wildlife rehabilitator though many rehabbers will not take on animals unless they are injured or naturally displaced. You can also read about birds in the chimney here. These are some of our prime bird control areas: - Phoenix Bird Control in Arizona, - San Jose Bird Removal and - Sacramento Bird Control in California, - Denver Bird Removal in Colorado, - Orlando Bird Control and - Miami Bird Removal in Florida, - Chicago Bird Control in Illinois, - Charlotte NC Bird Removal in North Carolina, - Portland Bird Control in Oregon, - Philadelphia Bird Removal in Pennsylvania, - Houston Bird Control in Texas, and - Seattle Bird Removal in the state of Washington.